Looking at the worldwide Purchasing Manager’s Indexes (most surveys conducted by Markit) we can see widespread softness, though levels still show expanding manufacturing orders. We are still seeing PMI levels showing decent growth in the US and, less convincingly, in the rest of the world. The US, UK, Canada, China and Japan all show lower PMI readings compared to three months ago, with the Eurozone looking a little brighter. Part of the weakness is likely related to the oil slowdown as it seems plausible that oil producers would cut orders faster than firms benefited by lower energy prices would add equipment. 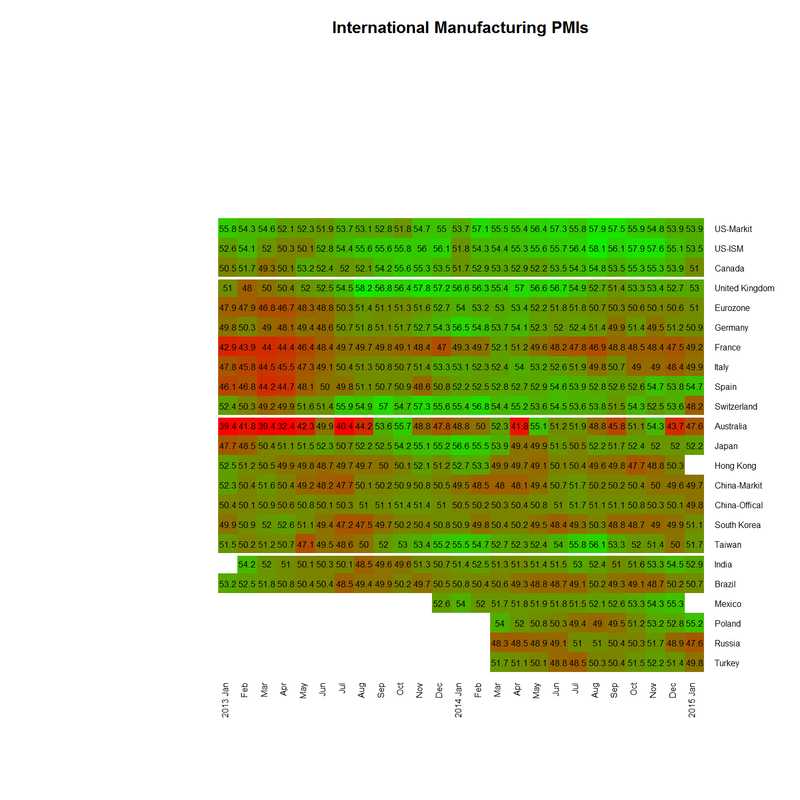 Chart 1 shows a heatmap, with countries in rows and dates in columns. The redder the cell the worse the reading, the greener the cell the better with a sort of muddy brown around 50 line indicating stable orders. Note that the US and China have two surveys (conducted by different organizations) each. The largest drop this month was in Switzerland, related to the shock rise in the Swiss franc against its main trading partner, the euro. Switzerland is almost at the depressed levels of Russia, which has struggled under numerous negative shocks. One flaw with this sort of heatmap is that it makes every country seem equally important. Making the row heights a function of GDP is possible but makes the chart hard to read. 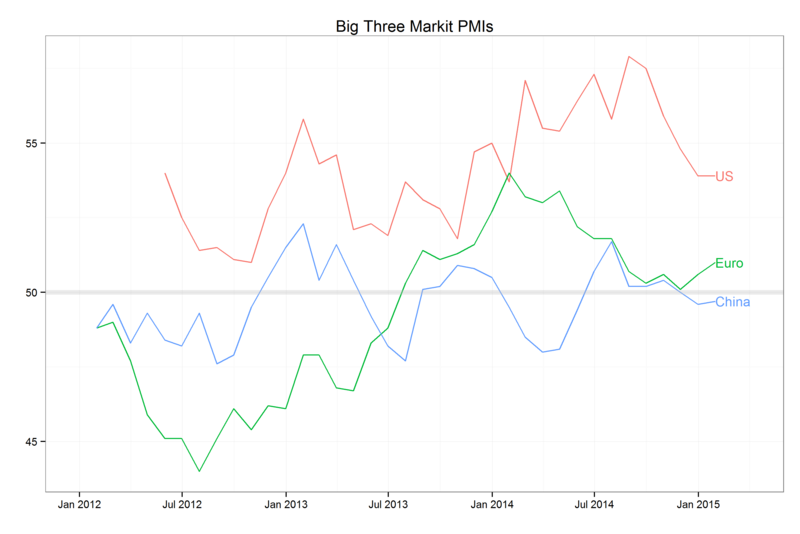 Instead, in Chart 2 I will pull out just the Markit PMIs for US, China and the Eurozone. Here we see a modest weakening over the last three months, though not the sharp drop usually coincident with a recession. The final chart sums all countries and weighs by their GDP. Again we see weakness worth noticing, but not the signs of a broad global downturn. 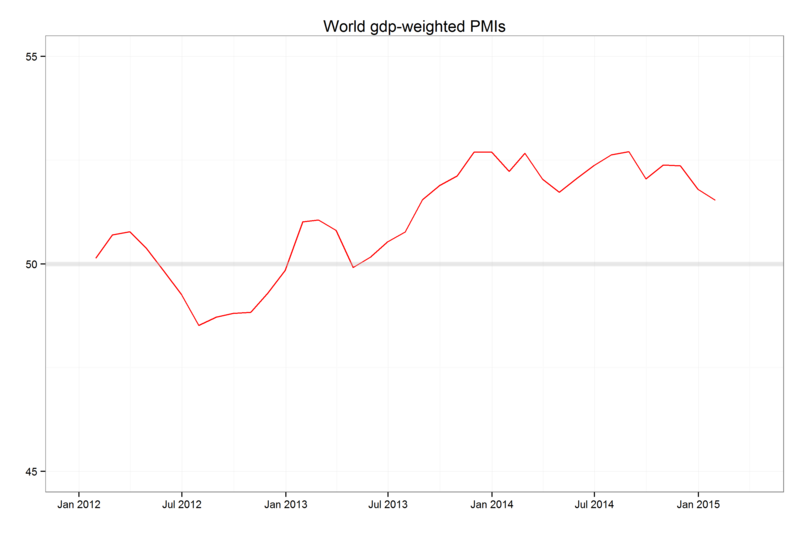 Chart 3- World GDP weighted PMI. Source: Markit, Bloomberg, Astor calculations. Overall, at Astor we are perhaps slightly less optimistic about the US economy than we were a few months ago, and nervously watching the rest of the world. Nevertheless we consider as growth in the US and the world at large the most likely outcome for 2015.